Montrose, CA. . . Based on a high-performance ARM core, the SBC1625 from Micro/sys provides a powerful, network-ready controller in a PC/104 (3.55" x 3.775") footprint that will operate from –40°C to +85°C. The CPU has dual network processing engines to drive the 10/100BASE-T Ethernet. This offloads networking tasks, such as Ethernet filtering, which allows a high level of throughput, while consuming less than 3.8W max at its full 533MHz CPU clock speed. Applications ranging from industrial controllers to protocol converters to gateways can all be implemented on a single board. In addition to its powerful networking features, the SBC1625 also features 24 digital I/O lines, eight readable DIP switches, eight LEDs for application use, and four RS232 serial ports. One of those serial ports can also be configured for RS485 communication. With 128MB of SDRAM, and a 64MB resident flash array, high-performance control or data communications systems with feature-rich operating systems can be developed as single board solutions. 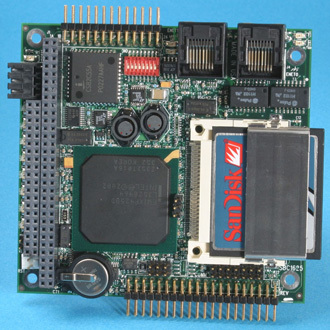 The SBC1625 can boot Linux, Windows CE, and VxWorks® from its onboard flash. If more I/O is needed, the SBC1625 allows expansion through its CompactFlash socket, which supports storage devices and I/O devices, such as Wi-Fi cards. Additionally, the SBC1625 has a 16-bit PC/104 bus interface, which allows access to numerous off-the-shelf boards, such as modems, analog I/O, or digital I/O. In its stackthrough version, the SBC1625 is ideal for plugging into a custom OEM I/O card. The SBC1625 is implemented with the efficient Intel IXP425 XScale processor, which has a super-pipelined RISC architecture. The IXP425 offers speeds from 266MHz to 533MHz, on-chip cache, a watchdog timer, 133MHz SDRAM access, and a USB device controller. A free development kit is provided that includes cables, sample software, and full documentation. The basic SBC1625 starts at $495 in single quantity. An industrial temperature (-40°C to +85°C) version is also available starting at $555. Optional features are quite cost-effective, as they do not require additional boards. Significant OEM discounts are available. Contact Technical Sales Dept., Micro/sys, Inc., 3730 Park Place, Montrose, CA, 91020, phone (818) 244-4600, FAX (818) 244-4246, email: info@embeddedsys.com, URL: www.embeddedsys.com.